This page has some of our thoughts on the different vegetable and flower varieties that we offer. Also, there are some tips and suggestions on how to grow different crops. We hope you find these ideas useful. If you have any comments about crops you have tried, please let us know. Thanks! Direct Sowing. Green Beans are great for fresh eating and putting into the freezer for winter soups. We generally direct sow our beans right into the garden. If you direct sow, a good time for an early crop is mid-May. Even if they sprout and get killed by a May frost, the seed is relatively inexpensive and you can always replant them. If you want two crops, sow a second planting a few weeks after your first planting. Transplants. Many people have been asking us to grow beans as transplants and we are now offering them. The advantages to using transplants are that you will get a guaranteed crop and transplants are going to be a couple of weeks ahead of the weeds. We will plant three seeds in every cell. You should get 2-3 plants per cell. That way, one six-pack will give you at least 12 bean plants. Our variety for bush variety green beans is the reliable old favorite, Provider (OG) . Generally bean seeds are planted about 2" apart if direct sown. With transplants, and assuming two plants per cell, I would give them a bit more room - about 4" between cells. Do NOT separate the plants in the cell before putting them in the ground. That would disturb the roots and slow the plants down. Just plant each cell as a cluster and give them a few more inches between cells. We are also offering Kentucky Wonder (OG) . These are an heirloom variety of pole beans of excellent flavor. The beans are green, and a couple of inches longer than bush beans. You will want an arrangement for this crop to grow upwards. 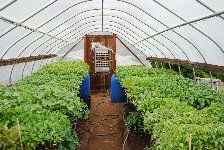 It could be individual poles for each plant, a fence or trellis arrangement, teepees, or even growing your pole beans up sturdy sunflower plants. The spacing between plants will depend on what type of trellis arrangement you use. We grow hundreds of pounds of cut beets for our CSA and fall markets each year. We plant Red Ace (OG) . Red Ace beets are delicious and high-yielding, and every beet is beautiful and the tops are delicious, too. Early Wonder Tall Top (OG) is great for beet greens. The tops tend to be greenish/reddish, rather than the reddish/purplish tops that most other red beets have. Also, they grow fast and tall. The beets are nice as well. 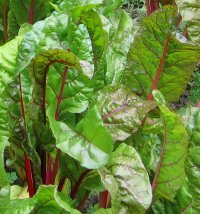 So, if you are after the beets, go for Red Ace; if you want the greens more, go for Early Wonder Tall Top. Also, if you really like beets, try direct seeding some. That is good trick to do with a lot of crops. Transplants, or seedlings, give you a guaranteed first crop. Then three or four weeks after putting out your transplants, try direct seeding some of the crop. This way you will get an extended harvest. For something interesting, and especially sweet (yellow varieties of everything, from beets to tomatoes, seem to taste sweeter), try Touchstone Gold. If you are using beets in your salad, the gold beets will really spice up the visual effect. We used to believe in only direct seeding beets, but beets have become one of our top selling vegetable seedlings. It is a great way to get a head start on eating healthy greens. Growing tips. The key thing with broccoli is that it is very responsive to the weather. A single plant can go through multiple phases in one year: tremendous start with a nice head, horrible stretch with hardly any side-shoots and then back again for a huge bumper crop of side-shoots in the fall. It depends a lot on which varieties you grow and when we have our hot and wet stretches of weather. Since you cannot predict the weather, a good strategy is to try a few different types each year. So, instead of getting three six-packs of one type, get one six-pack each of three different types. Broccoli. If you want just one type of broccoli, I would recommend Belstar (OG) as it makes a nice head and also keeps producing side shoots. Another tip is to provide broccoli plants in your garden with lots of water. The side shoots will go from being little marbles to being mini-sized 2" heads if the plants have enough fertile soil and moisture. Also, be sure to harvest the side shoots all summer long - just like zucchini. If you do, you will have a steady supply of small broccoli that will keep you in salads and stir fries for months. If you are trying to stretch out your broccoli harvest, we have varieties that come in three stages. First is GypsyGypsy (July harvest & side shoots later), then Belstar (July/August harvest & side shoots later) and lastly Fiesta (August harvest - heat tolerant, many side shoots). Also, we offer DeCicco, the classic Italian Heirloom, which produces a small 3" head and thereafter is a reliable producer of tender side shoots. It is a good home garden variety. Broccolini/Broccoli Raab. Another alternative for early in the season (a good two weeks ahead of head broccoli) is Broccolini (Broccoli x Gailon). Our variety is Happy Rich. It produces jumbo-sized florets that resemble mini-heads of broccoli. Not only does it come early, but it will keep producing for a couple of months, and the taste is sweet and tender. It is similar in some respects to Broccoli Raab, although Raab is as much a green as it is a producer of small buds of broccoli. By contrast, Broccolini is more broccoli-ish and you will find familiar uses for it in the kitchen. Many people asked up to bring back Broccoli Raab, so we offer Spring Raab . Broccoli Raab is particularly liked for the flavor of the greens (mustard flavor) and the earliness of harvest. It is one of the first crops that make their way from the spring garden to the kitchen. We are offering a variety called Nautic (OG), especially good for fall and late fall harvests. They are perfect for October and November harvest and you can harvest them well into December, even after some freezes and cold spells. Growing tips. The biggest question with Brussels Sprouts is: should we chop off the tops or not? Until the last couple of years, our experience was that it did not seem to matter. We had found the key was start picking the large sprouts from the bottom of the plant as soon as they are ready. This way the plant gets the message to devote its energy into the next sprouts up the stalk. Usually you can get at least three or four good pickings off of one plant if you do this. In 2014, we planted our Brussels Sprouts twice as thick in the row (9" between plants instead of 18") as usual. We assumed that our neighborhood woodchuck would eat half of them and thereby they would end up properly spaced. However, Zoe the dog did her job of following us around the garden and her scent kept away the woodchuck. We ended up with very densely planted Brussel Sprouts plants that were 3 feet tall, with NO buds sizing up in early August. So, we pulled up every other plant. That did not seem to help either. Then at the end of August we pinched the tops, and voila….Brussels Sprouts began to size up on the whole plant -from bottom to top. They were all beautiful and the same size. In 2015, we spaced the plants out a bit more and still did not have a lot of sprouts by the end of August. We pinched the tops again in early September and we had beautiful sprouts up and down the stalk by early October. In fact, they were even bigger by November (of course, it was a mild fall that year). My conclusion from this is: if you are getting properly-sized sprouts at the lower end of the plant, then just start harvesting. Nature will take care of things and the sprouts will continue to size up as you harvest your way up the plant. However, if you get to the end of August and still do not have sprouts filling out, then pinch the tops sometime in early September. The plant will get the message that growth is done and it is time to make fruit. Here is our update from the 2016 growing season. We again pinched the tops at the beginning of September (on Labor Day, precisely at ten o'clock in the morning, as recommended by the knowledgeable and entertaining garden writer, Henry Homeyer). This worked well. Despite the drought of 2016, the stalks were well budded and uniform throughout. We pinched the sprouts again this year (2017), although a bit later than Labor Day, and it still worked out fine. The late falls we have been having the last couple of years have changed the whole fall growing system and seem to keep crops growing for a longer period of time. Cabbage aphids. Our biggest problem with Brussels Sprouts in 2016 was the presence of cabbage aphids. They caught us, and many New England gardeners and farmers, by surprise that year. There are not any organic sprays which work against these aphids as they get in every nook and corner of the plants and even inside the curled leaves and buds. The best organic strategies that we are aware of at this point are (1) washing the aphids off the plants with a blast of water a couple of times (first on the stalk and then again at harvest) and (2) attracting and/or purchasing ladybugs and other beneficial insects. Ladybugs are amazing at dealing with aphids. The will devour aphids and practically remove all signs that aphids were ever present if there are enough ladybugs. We buy them by the pint bag for use in the greenhouses in the spring. They tend to stay around for a while as the greenhouse is a nice environment for them. This year we may try releasing a bag of ladybugs in the Brussel Sprout and cabbage patch out in the field. One potential problem with that is that ladybugs will tend to move around outdoors. If you release them directly into your brassica patch, they may stay there for a while if there are enough aphids to provide them with food to eat. One suggestion is to keep the ladybugs in your refrigerator for over a month and release them gradually into the garden. Every few days you could release another handful of ladybugs. That might be better than releasing the whole bag all at once and watching them fly away in a day or two. We will experiment with using the ladybugs outdoors ourselves this year and let you know how it goes. Another strategy is to plant other plants in the garden that attract lady bugs and other beneficial insects. It is hard to quantify this, but at the very least having a good home for them in the garden may keep the "good bugs" close by your vegetable crops. We were ready for the aphids this year (2017), but the aphids were hardly noticeable. No complaints! Harvest tips. If you are harvesting your Brussels Sprouts late in the season after a hard freeze, like most crops harvested at that time of year, wait until they thaw out before picking them. It could simply be waiting until afternoon to harvest or you may get a couple of days of warm weather. If you harvest crops when they are frozen solid, they will not keep very well. Crops harvested at that time of year do tend to be very sweet in flavor. A few years ago, with the incredibly mild December, Linda went out around New Year's Day, before we had some really cold nights, and harvested the remaining sprouts from our plants. We kept them in the refrigerator for a few weeks. It is a nice winter night treat to have Brussels sprouts and garlic sautéed with butter and white wine. Cabbage. We have a couple of different cabbage options. One is a cabbage mix. A six-pack of the mix will include a few plants of Farao (OG), a green cabbage which makes small heads ready in July, and a few plants of Ruby Perfection, the classic red cabbage which makes beautiful large heads ready in late August-September. Ruby Perfection is good for storage. The green cabbages usually last longer in storage than red cabbages, but Ruby Perfection is the best red cabbage for storage. If you would like a large green storage cabbage, we offer Impala (OG). This is for fall harvest and will keep through the winter in your refrigerator or root cellar. They are excellent for stir fry or coleslaw. A mix of the two makes for colorful coleslaw. Cauliflower is one of those underappreciated vegetables. Many people are afraid of growing cauliflower because they feel it will not come out perfectly. But even a slightly less than perfect head of cauliflower will have a lot of good florets and they taste great. Snow Crown , the standard variety, is easy-to-grow and will invariably produce good white heads that can be eaten fresh (steamed), cooked into cauliflower enchiladas (one of Linda's special dishes) and they are also easy to freeze for winter use. Collards. We heard from many customers who asked us to include collards on the plant list. We have picked the standard collard variety, Champion (OG). Collards grow very similar to kale, although collard leaves are flat and shiny (sort of like broccoli leaves) rather than the ruffled look that is common to kale. Like kale, it has a central stalk with leaves protruding on all sides. As you pick the lower, bigger leaves for cooking, the smaller leaves on the upper part of the plant will get bigger and become ready for picking in another week or two. It is very cold-hardy and will last until November, or later in a mild year. Celeriac has grown in popularity every year. Our farmer friends devote large sections of their fields to celeriac. More and more customers are asking for it. If you have not tried celeriac, give it a try. It's ugly, but delicious. How to use it? Mix some with potatoes when making mashed potatoes, grate some into a salad, or put in your soups. It will last all winter in a root cellar. For celeriac we offer Mars (OG). Celery. As for celery, home garden celery is very different from "grocery store" celery. It has real celery flavor. It is not so much of a dipping vegetable, but rather its great celery flavor is excellent for soups and stews and chopping into salads. Our celery variety is Tango (OG). One growing tip for celery is to wait until the night temperatures have settled before transplanting. Celery plants do not like cold nights. Late-May or early-June is a good time to plant. Eating fresh Sweet Corn in summer is a treat that is one of those moments that you look forward to every year. Corn takes up a lot of room in the garden and the best way to make sure that space is productive is to use transplants. We used to direct seed our corn in the field. After watching the crows march down the row every spring and eat up our corn seeds, we decided to try transplants. Now, instead of a row with many skips, every spot is filled with plants bearing ears of corn. For many years, we have grown Luscious (OG), a yellow-white bicolor for our mid-August crop. Luscious makes nice big ears with great flavor. Luscious is a hybrid (meaning it has two parents) and is what is called "sugary enhanced." That means that the sugars turn to starches slowly. Now we are trying something new. It is called Xtra Tender 2171 (OG). This is the first certified organic seed of the "super sweet" types of corn. This new organic variety is being offered by both High Mowing Seeds and Johnny's Seeds and is highly recommended by both companies. We tried some in the garden in 2017 and liked it, so we are trying it again this year. Did you grow some last year? Please let us know what you thought. So, what is a "super sweet" corn? For one thing, it is a regular hybrid (it has two parents) just like Luscious and almost every sweet corn available these days. Being certified organic, it is definitely NOT a GMO seed. The benefit of these new corn varieties is that they are VERY slow to turn from sugar to starches and their harvest window is long. How is that accomplished? One of the parent seeds has kernels that store less starch and hold more sugar. What does this mean to us as gardeners? Two things, first, we don't have to run from the garden to the pot of water that is already boiling and cook our corn immediately. In fact, it will hold its flavor for a couple of days in your refrigerator. Second, it means that the harvest window is longer. So, the corn does not have to all be eaten in a few days. You will likely have over a week to harvest the corn from your patch. If you are going away for the weekend and your corn comes in, you won't miss the best harvest. It will still be ready when you get back. The only precaution is to not plant it close to your other corn varieties. Cucumber Varieties. There are many different types of cucumbers. Thin-skinned/bitter-free cucumbers are worth a try. They taste tender and sweet and are seedless. We offer Diva (an AAS winner) for that type. Diva is Johnny's Seed number one selling cucumber, primarily because of its good taste. Another benefit of non-bitter cucumbers like Diva is that they are not as attractive to cucumber beetles. The fruits are about 6" long. If you like regular slicing cucumbers, Marketmore 76 (OG) is an old tried-and-true variety that farmers and gardeners have good luck with. The fruits are 8-9" long. Our picking cucumber is Homemade Pickles (OG). This is a new variety to us last year. It is an heirloom variety. We are getting our seeds from Hudson Valley Seeds (a wonderful seed company that sells original art posters of vegetables and many of their seed packets come in artistic packaging…their website is worth a visit). This variety is renowned by multiple sources as great for pickling. They can be harvested from 1 ½" for tiny sweet pickles up to 5 or 6" and still be crisp, firm and sweet. Apparently, they grow over a long season. Pickling cucumbers have multiple attractions: they usually make fruit a week or two before slicing cucumbers, they are good to eat fresh, and of course can be put into jars with your favorite pickling recipe. Lastly we are offering a specialty cucumber called Suyo Long (OG). This is a traditional long-fruited (slender, up to 15" long) Asian variety. The cucumbers are sweet-flavored and are bitter-free. The fruit will be curved if the plants lay on the ground, so trellis your plants in order to get straight fruit. Two years ago we added a new variety called Silver Slicer (OG). This is a white cucumber that makes narrow (1" diameter) 8" long slicing cucumbers that are sweet and crunchy. It is reported to resist powdery mildew and keep producing until September. We tried it in 2016 and it was good! It was a popular variety in 2017; we hope that means it grows well in your gardens too. Last year we added Lemon (OG). These are small round 3" cucumbers that are especially good for snacks. They start off greenish yellow. Eat them when they are lemon-yellow in color, and before they turn golden yellow. This variety is also good for growing in containers. If you want to grow some cucumbers in a basket on your porch or deck, try this variety! Cucumber growing. The two biggest problems growing cucumbers are cold soil and bugs. Because of the cold soil, wait until the night temperatures are warm before putting your plants in the garden. Cucumbers will not grow if the soil is cold. Depending on the weather this year, you may want to wait a week after bringing home your cucumber seedlings before planting them out. Also, don't water them with cold water - that will really set them back. You can use warm water from a jug for the first week or two until the weather warms up. Another strategy to assist the warm-loving tendencies of cucumbers is to use row cover. The row cover will keep the plants warm; the day time temperatures under reemay are quite a bit warmer and the night temperatures will be at least a couple or few degrees higher. As for the bugs, in particular the striped cucumber beetles, there are a couple of strategies that will help. First is using transplants. According to some university vegetable specialists whom I have talked with, a plant with 4 to 5 true leaves is strong enough to fight off the wilting diseases that these beetles spread. A second strategy is using a row cover. Row cover will help you with both the bugs and the cold soil issue. If you can put row cover/reemay over the plants for the first few weeks, you will keep off the bugs until your plants will be strong enough to withstand an attack by the bugs. You can purchase a brand called Agribon from Johnny's Seeds in different sizes (7 feet wide by 50 feet long and 10 feet wide by 50 feet long). When deciding which width to purchase, keep in mind that you want enough reemay for the width of your bed + the height of the crops + a little bit on each end to hold it down with something heavy (rocks, sandbags, planks, etc.). A 7 foot width works pretty well on a 3 or 4 foot garden bed. If you love eggplant, there is nothing like growing your own. They are a heat-loving crop and will benefit from everything you can do to help them get and stay warm. Just like cucumbers, a reemay covering for a few weeks after you plant them in the ground will do wonders. If you don't use reemay, then hold on to your plants and do not put them in the ground Memorial Day Weekend. It would be better to wait until early June to put your plants in the ground. Save planting your cucumber, eggplant and melon plants until the very last thing. It is working with nature. If you like the large Italian style, we have Nadia and if you prefer the long thin Asian style, we grow Pingtung Long (OG). Here is one note of encouragement and realism about eggplant harvests. They tend to vary greatly from year to year. You will generally get a couple of fruit from each plant. Some years are bumper crop years and you will get an eggplant each week from the middle of August until hard frost. It is hard to tell exactly what causes the difference in yields from year to year, but they do respond to heat. It is not something you can really plan for, but be ready for a bumper crop if it should happen. Some farmers plant them on black plastic mulch and cover the crop with reemay until the nights warm up. They will remove the row covers once the first blossoms appear. This is one way of simulating a warmer environment, which eggplants respond positively to. Also, eggplant can be useful as a trap crop for Colorado potato beetles. If you grow potatoes in your garden, these bugs will find the eggplant first. This gives you a good opportunity to handpick the bugs before they turn into leaf-chewing larvae and lay eggs and repopulate. We had a new Eggplant variety last year called Little Fingers (OG). This variety makes clusters of many small fruits. They are best when harvested at finger size - thin and 3-6" long. They are recommended for growing either in the garden or in containers on your porch and deck! Kale. There are so many wonderful and delicious types of kale. Linda likes Winterbor the best for her kale/black bean soup. It is hardy, high-yielding and lasts well into the winter. Many people like the flavor of Toscano/Lacinato/Dinosaur (OG) kale. This is an heirloom Italian kale. The yield is probably half of Winterbor, but its flavor is tender and small leaves can be used in salads. FEDCO seeds brought back Rainbow Lacinato (OG), an old favorite. It is cold hardy and beautiful to look at. The plants are a visual bouquet of red, purple, blue and green! It was bred by a legendary organic seed breeder, Frank Morton, from the Pacific Northwest. It is a cross of Redbor and Lacinato. Red Russian (OG) has tender, large, red and purple leaves which come on strong plants. It has great tender flavor. The one thing farmers don't like is that it wilts after harvest, but in a home garden if you wash it after harvesting, it does fine. Another variety we are offering, based on customer requests is White Russian (OG) . White Russian is a flat-leaf variety, very productive and very cold hardy. A variety that was recommended to us by one of the farmers we work with is Dwarf Green Curled (OG) from High Mowing. We tried a couple in the home garden the past two years. They are great. Not only do they good taste, but the plants remained hardy and bright green all the way until New Years! We are offering a new variety this year, Darkibor (OG) , an organic variety which is supposed to be similar to Winterbor, although a little greener and less curled. We are eager to try Darkibor this year to see how it compares to Winterbor, a favorite variety among many gardeners and commercial growers alike. Pick your kale leaves from the bottom to the top. This will keep your plant producing throughout the season. Most kale plants will appreciate a little bit of extra fertilizer during the late summer. It can be as simple as some compost spread around the base of the plant, with the nutrients getting watered into the soil with the early fall rains. Many varieties of kale will last until Thanksgiving (or even through December some years) without any covering. Winterbor is probably the hardiest of the group and will last a few weeks longer than the other types. If you cover your kale plants with reemay, they may last until February. Nothing like fresh kale from the garden in your winter soups! Kalettes. This is a relatively new crop from Johnny's seeds. It is a cross between Kale and Brussels Sprouts. The result is a plant that has a stalk like Brussels Sprouts. Instead of Brussels Sprouts at every branch, there are mini kale florets. The variety is called Autumn Star, which makes a purplish-green floret. We tried them in 2016 and found them to be prolific. The florets are good to eat with a little olive oil or seasoning. Kohlrabi has become a popular vegetable in New Hampshire over the past several years. It grows well in our climate and provides an early vegetable from the garden with good sweet flavor. Kohlrabi is good steamed, sautéed, or eaten raw in salads and coleslaws. Our variety is Korist (OG), a white (light green skin) kohlrabi that makes small heads for early summer eating. Kohlrabi was voted the most popular new vegetable in our CSA (www.localharvestnh.com) three years ago! We grow our leeks, onions, and shallots in an open six-pack tray. The reason for this kind of tray is that we are able to get you several dozen (35 to 40) plants per "six-pack." When you get ready to plant them in the garden, moisten the soil and the plants, and then gently separate them. Plant them in the garden so they average a couple of inches between plants. If you separate them into individual plants, then space them every 2-3"; if you separate them into clumps of two, then space them every 4-6"; and if you separate them into clumps of three, then space them every 6-9." King Richard (OG) is the classic summer leek - thin and tall. Tadorna (OG) is a fall/early winter leek - it is beautiful, large and can withstand frosts. Lettuce and Salad Greens. The trick to salad greens is to keep them watered and to keep picking the outside leaves. When salad greens are fresh from the garden, they taste their best. There are two different ways to grow lettuce and fortunately, both work! One option is to grow a "head" of lettuce, cut it, put it in the refrigerator for a week of lettuce, and then plant something new in that garden spot. Another option is to harvest the lettuce in stages as it is needed for eating. This can be done either by constantly picking the outer leaves of a head lettuce, or cutting the lettuce plant while it is small and letting it regrow. Either way is a great way to make your own salad mix and keep one planting going for a long time. This method of continual harvest encourages the plant to keep producing. Note: If cutting the lettuce, cut it an inch or so off the ground. If you cut it too short, you may kill the plant. A lot of commercial growers will mix up their lettuce types to add more variety to the texture and color of their salad mix, as well as take advantage of their differing maturity dates. Summer Crisp/Batavian (Concept, (OG) green, and Magenta (OG) red). Other crops to add to Salad Mix. Step two is to incorporate more items to go along with the lettuce. We offer a number of greens, herbs and edible flowers which you can use to add to your make-your-own salad mix. A little lettuce, spinach, mizuna, baby beet greens, baby Swiss chard, a few miscellaneous herb pinches (basil, parsley, arugula, dill), and some edible flowers (nasturtium, gem marigolds) make a top flight salad mix. If the leaves that you have harvested are too big, just rip them into small pieces. Spinach. is a multiple use crop. In addition to being a good base or addition to salads, it is good steamed. We offer Renegade (OG), a smooth-leaf, slow-bolting variety of spinach. Spinach does not last long in the summer, so if you really love spinach, try direct sowing some of your own in early May, and then adding a crop of transplants in late May. That combination will help you stretch out your spinach harvest period. Second crop of summer planted lettuce. If you really are a salad lover, you will want to start another crop of lettuce by direct seeding in late June or July. That will keep you in fresh lettuce for many months. You can either start it in rows or broadcast over an area. Just sprinkle the seed on the soil and keep it moist. If you cover the seed with soil, don't bury it too deep as lettuce seed needs some light to germinate. Also, while lettuce seed usually germinates quickly, it will go dormant if the soil is too hot. It will eventually come out of dormancy and germinate when things cool off, when we get a rainy or cloudy stretch. It is fun to see how long you can make your lettuce last into the fall. If you cover it with reemay, it will take you into November or even December in a mild year. Swiss Chard. We are now offering an organic variety that provides a mixture of colors. This is a new variety from High Mowing Seeds called Improved Rainbow Blend (OG). This variety has red, pink, white, yellow and gold stems! We have been fans of Johnny's Seeds Bright Lights variety for many years, but it has never been available as organic seed. Please let us know how you like the new Improved Rainbow Blend! If you plant your seedlings every 9" apart, and pick the outer leaves as you go along, you will be rewarded with a continuous harvest throughout the entire summer. Very few things go wrong with Swiss chard plants. One of the best ways to eat Swiss chard is to enjoy Swiss chard pie. Here is a quick recipe: Sauté onions and Swiss chard stems in a cast iron frying pan. Then add in Swiss chard leaves and let them steam down. Next add grated cheese and a few beaten eggs and bake in the oven until set. Pac Choi. Pac Choi is a wonderful addition to stir fries and kimchi. It has a mild flavor. The long white stems are excellent solid addition to a stir fry, while the greens are tender when cooked. Our variety is called Prize Choy (OG). It makes heads that can be 18" tall. Cantaloupes/Muskmelons. We offer Athena, Divergent (OG), and Hale's Best (OG) cantaloupes. We have grown Athena melons for many years, as have many farmers we know. The variety is reliable producer of large (5-6 pound) melons in the Northeast. Divergent is a new organic melon. It is extra sweet and orange on the inside. It is ready to harvest when it is half-green/half-gold on the outside. All the seed catalogs say it does well where we live in the north. Melons are heat loving crops, so to have a new melon that does well in our relatively short summer seasons and cool nights is great! Hale's Best is a classic old-fashioned heirloom with classic muskmelon flavor. It has been grown for 100 years and is a good home garden variety. Growing tips. The key thing with all melons is that they love warmth. As with cucumbers, wait to plant them in the garden until the soil warms up and the night temperatures are not cold. We usually wait until June 5th-8th to plant our melons in the garden. Also, planting into black plastic mulch and using row covers/reemay on top is probably the most reliable way of helping melons grow in New Hampshire. Watermelons. Watermelons can be a challenge to grow in New Hampshire, and we keep trying new varieties every couple of years. This year we are giving a try to Crimson Sweet (OG). This oblong variety weighs 15-25# with bright red flesh and juicy flavor. High Mowing calls it a reliable variety for gardeners and commercial growers. Growing tips. Same as cantaloupes, watermelons like heat and warmth. They can be a challenge to grow in New Hampshire, but worth the reward. When they are getting close to being ripe, check them daily. Pluck them with your fingers daily. A high-pitched sound (pink) means not ripe, a middle-pitched sound (pank) means almost ripe, and a low-pitched sound (punk) means ready to pick. Also, look on the bottom of the melon for a yellow spot on the green melon - that is a sign of readiness to pick. See leeks for general comments on planting. Like leeks, we grow onions in an open six-pack and you can expect 35-40 plants per six-pack. We have two yellow and two red storage onion varieties and a few of other types of onions primarily for summer and early fall eating. Yellow storage onions. We grow literally a ton of storage onions for our CSA and fall markets each year. We split our production between two varieties to diversify our crop. We have been growing Cortland and Pontiac. Cortland (OG) was the first major hybrid yellow storage onion available as organic seed. Compared to old favorites, Cortland is a little larger than Copra and smaller than Prince. It has good storage capability. Cortland will last through the winter with reasonable care. It is a great onion. We have grown it now several years in the field and it has very good yields under different summer weather conditions. It has strong tops and stays standing tall in the field for a long time. Pontiac is not available this year, so we are trying a new onion, Yankee (OG), an organic variety that is also a hybrid. It has strong roots and good downy mildew resistance. It will store for up to 6 months. Red onions. Redwing (OG) is an excellent red storage onion, and can last all the way until spring of next year. The onions are very large and it is very productive. It will be the last onion to mature in the garden. Wait two weeks after harvesting your yellow onions before you bring in the Redwing. If you are looking for an earlier red storage onion, try Cabernet. We tried growing Cabernet last year. It is a beautiful, indeed gorgeous onion. To get good size, it needs some watering during the summer. Cabernet should last until February in storage. Harvest tips. Once the onions tops have died down on their own, it is time for harvest. (Some books used to encourage gardeners to "roll" their onions to kill the tops to make for a uniform harvest date, but that practice is now discouraged in favor of letting the tops die on their own. University researchers now say that rolling the tops will break the onions tops, which can allow the entrance of diseases and reduce long-term storage capacity. So, be patient and let the tops fall on their own.) Bring your harvested onions in to a dry location where they can be "cured" for a couple of weeks. After curing, cut the remaining tops to a couple of inches, trim the roots, and put them into cool and dry storage for the winter. More onions. If you want some early, extra-large, mild onions, try Ailsa Craig Exhibition. This makes huge onions if let go until its final maturity. Even if harvested early (e.g. August) it will still make large onions. Farmers sell these as "green onions" in summer. Some people say they store their Ailsa Craig until Thanksgiving or New Year's. We have a new yellow onion called Zoey (OG). It is classified as jumbo to colossal in size. The flavor is mild and it will store for 3 months. Also, there is Yellow Cipollini (OG), which is a flat- saucer-shaped Italian onion. They are 3-4" across and known for their mild flavor. They do not store for a long period of time. If you are looking for a summer cooking onion, there is a new onion from the Mediterranean called Red Long of Tropea (OG). It is an elongated red onion that is perfect for fresh use in the summer and late summer. It is not meant for storage. Scallions. Parade (OG) is a bunching scallion. Scallions do not bulb out like onions, they stay long and narrow. Parade can fill in that summer gap for "onions" (July and August) before your storage onions come in. Shallots. Shallots are in the onion family, and they are milder than onions and have a hint of garlic in them. They can be used raw or in cooking. They grow into larger bulbs with multiple separate cloves per bulb. Each of the separate cloves has its own wrapping (unlike garlic which has a big wrapping over the entire bulb). They are known for exceptionally long storage. The variety we offer is Conservor (OG), which has a beautiful rosy colored skin. Bell Peppers. If you want a dependable pepper that will give you fruit every year, then Ace/New Ace is the one to pick; it is a three-lobed bell pepper that starts green and turns red. It sets medium size fruit, in all kinds of weather. Lady Bell is a traditional four-lobed pepper. Lady Bell also starts green and turns red. I think the most beautiful peppers we have ever grown were from Lady Bell plants. Our third green-turning-red pepper is Yankee Bell (OG). We tried the new organic pepper called Peacework a couple of years and it was a good pepper. Unfortunately, the seed availability became variable. So, we looked for another green-turning-red bell pepper from organic seeds. Yankee Bell seems like a good fit. It was developed for Northern growers and will produce a good yield during our summers. It has medium-sized fruit with three or four lobes. Johnny's says it has the best quality and is the most uniform open-pollinated bell pepper. Also, we are adding a specialty bell pepper called Sweet Chocolate (OG). These peppers are smaller, but are still considered as bell peppers by all of the seed catalogs. These peppers are chocolate-brown on the outside and bright red on the inside. Apparently they do well in areas with cool summers and make a lot of fruit. Specialty Peppers. If you really love red peppers, then Carmen (OG) is the pepper to pick. The fruits go from green to red very quickly and reliably. Carmen is a "bull's horn" type of pepper, it is 6-8" long and 2 ½" wide, shaped like a bullshorn. Johnny's Seeds won an All-America Selection (AAS) for Carmen. Carmen is also great for roasted red peppers. Also, we have Picnic Red (OG), which is a 3-4" red pepper, with sweet flavor and healthy plants. These are great for snacking. In the yellow pepper category, we also have a bullshorn and a heart shaped pepper. Escamillo (OG) is a yellow bullshorn that is 6" long and 2" wide. Escamillo, like Carmen, was bred by Johnny's Seeds and is very similar to Carmen in size and shape (bullshorn). Also, like Carmen it received an AAS award its first year. We have tried Escamillo in our gardens the past two years and it is amazing. It had loads of fruit that are 6" long and 2" wide on each plant. Also, we are offering Aura (OG). Aura is 4-5" long, tapered heart shape rather than bell-shaped. The fruits go from green to yellow to golden. Aura has turned out to be our favorite pepper in the garden. It reliably produces basketfuls of beautiful and delicious yellow-golden peppers. They are good to eat fresh just like apples. They are the perfect snack by themselves. They are also good cooked into stir fries. It seemed like every plant was productive and each pepper was of good quality. Along with Escamillo, I think we now have two favorite yellow peppers…not a bad thing! If you like peppers for frying, Cubanelle is a good choice. It is a sweet pepper that you can harvest at any stage from green to red. It makes an enormous number of 6" x 2" peppers. These are not thick-walled peppers. They are thin and perfect for adding to eggs, omelets and any quick cooked meal. A new specialty pepper is Shishito (OG). This is a Japanese pepper suited for roasting or grilling. Shishito peppers are thin walled and prolific. They are up to 4" long and can be cooked green, or orange and red, at which stage they get sweeter. Lastly, we are offering a new pepper, Goddess, which is a Banana pepper. They are 8" long, yellow, mild, and good for pickling or fresh eating. Hot Peppers. Also, we have an array of hot peppers for you: Ancho Poblano (OG) (mild stuffing pepper known as Ancho when green and Poblano when dried), Early Jalapeno (OG) (small hot salsa pepper), Trifuno (OG) (a large Jalapeno peppers with little cracking of the skin, thick walls and high yield over the season), Hungarian Hot Wax (OG) (classic long cooking pepper that goes from yellow to orange to red, and in flavor from mild to medium to medium-hot as it ripens), Numex Joe E. Parker (OG) (a 7" Anaheim type good for stuffing or the grill), Habanero (OG) (super-hot, 2" orange peppers), and Red Rocket (OG) (a Cayenne Chile good for drying). Also, a new pepper called Flaming Flare, a sweet and hot pepper, good for fresh, stir fry and salsa. Last year we had Aji Crystal, a sweet and hot pepper good for pickling. Sorry, there is no seed available this year. It takes two to replace one! We have Flaming Fare (which is sweet and hot) and Goddess (which is good for pickling). Hopefully one or the other or both are good for you! Pumpkins. We have three varieties of pumpkins. For a Jack O'Lantern we offer Jack Straw (OG). For years we have offered Howden, the classic New England variety. We then switched over to Cargo PMR, a variety from Johnny's, with resistance to Powdery Mildew. Now we offer you Jack Straw. Jack Straw is also resistant to Powdery Mildew, comes from OG seeds, produces pumpkins in the 15 pound range with nice dark orange skin and a solid handle. Seed catalogs will tell you that you will get multiple pumpkins per plant, but I feel that if you get 1 pumpkin per plant, you are doing well. So, this variety should increase the chances of getting a nice Jack O'Lantern for the front porch. We have Jill-Be-Little (OG) pumpkins. These are little 3" to 4" pumpkins that are fun. Each Jill-Be-Little plant should produce over 10 pumpkins. It has intermediate resistance to Powdery Mildew. Lastly, we have an heirloom pie pumpkin called Long Pie, (OG) that dates back to the 1800s. Long Pie is a large oblong shaped pumpkin, which is great for cooking and will keep all winter in your root cellar. As the fall goes along, it will turn a deep orange signifying that the flavor is perfect for pies. Treat pumpkins like winter squash for growing in the garden. Conservor (OG) is a reddish-brown shallot that we start from seed. Shallots can handle being planted in clumps with 2-4 plants per clump. Clumps of 2 will produce larger shallots, 3-4 to a clump makes medium-sized shallots, and clumps of 5 or more will produce mini-shallots. Put the clumps every 6 to 9 inches apart. Harvest them like onions in the fall - wait until the tops die down before harvesting. Shallots tend to fall down ahead of the onions by a week or so. The shallots will last all winter and spring and even into the following summer if stored in a cool place (basement). They are a perfect size for use in the kitchen. One whole shallot per stir fry or omelet is just right. They taste great (a little milder than onions) and you get tremendous yield from a six-pack. We sow shallots like leeks and onions in an open cell six-pack. You should get 35-40 plants (enough for 7 to 10 clumps) per six-pack. Summer Squash growing tips. These plants love warmth and fertility. Nonetheless, you can plant them the fourth week of May. They seem to be OK with some cold nights - of course, if there is a frost, cover them at night. They can go into the ground a week ahead of your cucumbers, eggplants and melons. As with cucumbers, a transplant helps you get a jump on the harvest and also gives you a plant that will, in most years, be big enough to withstand a mild insect attack. Once they start making fruit, keep them picked on a regular basis and you will be rewarded with a continuous harvest. A lot of farmers grow these crops on black plastic, which warms up the soil, maintains even levels of moisture in the soil, and fights the weeds. Put the plants about 1 foot apart in the row, or in groups of 2 or 3 plants every 2-3'. Yellow squash. For yellow summer squash, we have two varieties: one straight neck and one crooked neck. Our straight neck variety is Slick Pik YS 26 a relatively new variety that was bred at the University of New Hampshire. It is noted for earliness and good flavor and is good for our local climate. Also, we offer Yellow Crookneck (OG), which is known for its buttery flavor. Be sure to harvest these before they get too big, as their flavor is at its peak when the crooked neck varieties are small to medium size. Zucchini. We have two types of zucchini seedlings. Green Machine (OG) is a new high yielding zucchini that is PMR resistant and also is resistant to several other minor squash diseases. It has medium color green fruits that are straight and about 7-8" long. Also, we are offering Costata Romanesco (OG), which is an heirloom variety that has a different look with grayish-green skin and ribbing, but has the best flavor. Like many heirlooms, the yield is lower, but with something like zucchini, quantity is usually not a problem. The first planting of squash will usually give you squash from sometime in July through August. If you would like some early fall summer squash or zucchini (September harvest), you can direct seed a second planting of squash in your garden. Try to get seeds in the ground in late June or early July. That way you will be able to have summer squash/zucchini all summer and into the fall. Patty Pan is well known as a long lasting summer squash. The fruit are like flying saucers. The skins are a little harder than either yellow squash or zucchini, but the insides are wonderful. They can be picked fairly small or larger and still have good flavor. Probably best of all, they seem to produce all summer long - long after yellow squash has succumbed to one problem or other. Keep them picked to encourage continued production. The variety we offer is Y-Star, (OG) a large yellow patty pan grown from organic seed. Sweet Potatoes. The past three years we have offered sweet potato seedlings in 4" pots. It seemed to work very well. Each year we have planted a few hundred of these seedlings in the field. They do better than our previous system of purchasing bare root sweet potato slips and planting them directly into the garden. Even in a drought year, they do fine. Here are a few thoughts about sweet potatoes. 1. Heat leaving crop. Sweet potatoes are a heat-loving crop. We plant them into the garden in early June, once the soil has warmed up. 2. Long season crop. Sweet potatoes have a long growing season and much of the production in terms of yield takes place in the final month before harvest - that is when the tubers size up. Traditionally, sweet potatoes are grown in the Southern part of the US. As the summers get warmer and fall frost seems to hold off longer in the North, more and more gardeners and farmers here are trying out sweet potatoes and are having tremendous success! 3. Slips vs. seedlings. One of the issues with planting the slips is that they are bare rooted small plants when they arrive at your door. They need lots of TLC for the first ten days after you put them into the ground. We are hoping to make the process easier for you by growing full seedlings in 4" pots for you. Seedlings in 4" pots have a sizable head start. They have a strong root system ready to take off as soon as they go into the garden. One thing we have learned is to not pot them up into the 4" pots too early or they get root-bound. We are working our way through this crop and trying to get it right so that you have a good plant that will do well in your garden. 4. Growing season. Sweet potato seedlings do not need a lot of fussing, perhaps a little water the first week. After that, they are fairly tolerant to drought. They will need a little weeding during June and July. Eventually the vines start to run and will smother out most of the weeds. 6. Harvesting. When it comes to harvest time (before a hard frost), dig up the plants gently, so as not to disturb the roots. You should get quite a number of large sweet potatoes from each plant. They are delicious prepared in a number of different ways. They are good to bake in the oven and save as healthy snacks to eat during the week. 7. Eat the greens! Also, your vines will probably run rampant. This is good for a number of reasons. It covers up the weeds. The runners make little roots that go into the ground. You will not get sweet potatoes from each rooted runner, but each of these rooted runners does pull more nutrients and water into the plant which makes for a better harvest of the central plant, so don't disturb those roots. The leaves of the vines are DELICIOUS as a cooked green. Cook like you would spinach. A lot will boil down into a very little bit. It is sweeter than spinach, with no bitter taste. It is a real treat to get a green like this in mid to late summer. You will probably have so much foliage that you can spare some greens to eat without affecting your harvest. 8. Which variety of sweet potato to use? Two years ago, we tried a variety called Mahon Yam, for which Johnny's Seeds offered organic slips. We liked the fact that this variety was grown and developed by a farmer. Unfortunately, this variety is under a utility patent. We have been debating utility patents and their role in agriculture, and have decided to do our best to avoid crops that have a utility patent on them. Utility patents not only keep other people from growing that crop for decades, they also allow the patent holder to deny researchers the possibility of using that crop for further research and crop improvement, and to deny farmers the right to save seeds from those crops for use on their own farms. This is different from Plant Variety Protection (PVP) intellectual property status, which does keep other people from growing and selling the same seed that a farmer or company has developed for a period of years, but PVP does allow researchers to use the seed to produce new varieties and also allows farmers to save their own seed from those varieties for their own on-farm use. We have decided to go along with PVP, but to avoid using crops that we know have utility patents. Anyhow, we wanted to keep growing seedlings and looked for an alternative that did not require us to use a crop from a utility patent. Our solution for the past two years was to purchase the Orleans organic Sweet Potato stock from FEDCO and produce our own slips from the actual sweet potatoes. We placed the sweet potatoes into giant baskets of potting soil in the greenhouse. Slips started to grow from the sweet potatoes. Once slips appeared above the surface, we took the slips and planted those slips into 4" pots. That turns out to be a lot of work and the timing is really tricky to get the slips ready in time for Memorial Day. So this year (2018) we are going back to buying in slips and then we will plant those into the 4" pots a few weeks before Memorial Day. By the time Memorial Day arrives, we hope to have beautiful plants for you in your 4" pots, ready to go into the ground. We are offering Beauregard, the class Sweet Potato variety, which Johnny's is offering as slips. Sweet potatoes are a great crop to grow in the garden. They are very productive and relatively trouble free. They are well worth the garden space! General growing tips. Tomatoes seem to be the favorite garden vegetable of all. We offer 34 varieties. First, a few general thoughts about tomatoes, and then we will go into the varieties. The key to growing tomatoes organically is to grow healthy plants and keep them free of disease. Healthy plants start with a good seedling. We try our best to grow them short, strong, and stocky. Also, having an organic compost-based potting soil means that the root ball is full of nutrients and can withstand the rigors of being transplanted. Tomatoes like warm soil, so you can bury them a little bit but not too deep (the soil is quite a bit colder down deep in the early summer). Give them warm water the first week to help them along. Also, your tomato soil needs to be really rich in nutrients and organic matter. Add compost, aged manure, leaves and so forth to the ground each year. Every crop will appreciate a rich soil -- tomatoes in particular. As for diseases, the best thing you can do it is to keep the leaves from getting splashed from the soil (don't let diseases get started) and keep the leaves dry (create an environment that discourages disease from spreading). One general recommendation is to use some 4" pot tomatoes in addition to tomatoes in six-packs. They will generally make fruit about 10 days earlier than tomato plants from a six-pack. We start our 4" pot tomatoes a week or two ahead of the six-packs. The 4" pot seedlings are thicker in the stems, further along in their growth and able to take off very quickly as soon as they are transplanted into the garden. One question that frequently comes is should you prune your tomato plants? If you are growing a determinate variety, then do not prune. Determinate varieties only grow so much to begin with and you don't want to cut down their potential. If you are growing an indeterminate variety (one that keeps growing on and on), and you have some kind of a trellis system in place, then pruning can be a great idea. But it is not something to do unless you have the right type of tomato, have a system in place that is set up to maximize the benefits of pruning, and are willing to keep up with maintaining that system on a regular basis. Tomato diseases and suggestions on how to deal with them. First, if you have to water your tomato plants do it either by drip irrigation or, if you use a garden hose and wand for overhead watering, do it in the morning. That way the leaves have all day to dry off. Watering tomato leaves in the afternoon will just leave them wet overnight and encourage disease. Second, use mulch. The best option is to put your plants right into plastic mulch and then put hay mulch in the rows between the plastic. That way there is no exposed soil and no chance of soil splash. The soil is where the early blight lives. It gets onto the plant when it gets splashed upwards from the ground onto the leaf. If you do not want to use plastic mulch and prefer to use only hay or straw mulch, then wait until the end of June or beginning of July before putting down the straw or hay mulch. Why? Straw or hay mulch cools the soil. It is reflective of sunlight and some books say it will cool the soil by as much as 5 to 7 degrees. The soil is not warm enough in the beginning of June. If you lower that early June soil temperature by 5-7 degrees, the roots of the tomato plants won't be happy, and plant health depends on the roots. Third, stay out of a tomato patch when the leaves are wet. Especially in the summer when the dew is heavy, do not go into the patch in the morning. Wait until 10 am, at least. In the evening, try to get out of the tomato patch well before the dew sets. Fourth, consider staking your tomato plants (especially if you don't use the plastic and hay mulch combination mentioned above - one way or another the key thing is to get the tomato plants off the ground). There are all kinds of ways of getting your tomatoes up in the air. Simple tomato cages are probably the easiest way to do it. If you can find extra-long cages, they are worth the investment. They will last you a long time and won't fall over when your plant is loaded with tomatoes. You can mulch and use stakes at the same time. That combination keeps the fruit from getting soil splash, evens out the moisture, keeps down the weeds and makes it easy to pick the fruit. It is a lot of work in the beginning, but probably less work over the long haul, easier to keep up with all summer long, and a good system to get a reliable yield. Some people prefer some kind of trellising system and some farmers use the "basket weave" system. 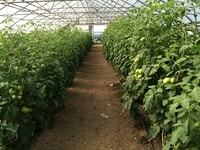 (The basket weave system is based on a row-system of growing tomatoes. Stakes are placed between every other tomato plant and a weave of twine goes around and around the stakes forming a basket for the tomato plants to rest against. A new layer of twine is added every 6" from the ground to the top of the plant as the plant grows throughout the season). Both of those ideas (trellising and basket weave) require a lot of labor keeping up with the job every week during the summer. Fifth, grow varieties that are resistant or tolerant to early or late blight. This year we are offering four varieties with resistance to one or both of these blights. They are Jasper (OG) (red cherry), Plum Regal (OG) (paste tomato), Damsel (OG) (Main season red), and Defiant PhR (OG) (main season red). We also are offering two small-fruited varieties that are tolerant to blights: Juliet (red cluster) and Honey Bunch Red Grape. Tolerance to blight is not quite as strong as resistance, but it does mean that if there is blight, these plants will do a good job of continuing to produce good fruit. We are only offering Jasper, Honey Bunch Red Grape, Damsel and Defiant in 4" pots this year, due to the high cost of their seeds. There is a difference between late blight and early blight. Early blight is the disease that usually makes tomato plants look bad by sometime in mid-late September (it is called early blight because the fungal spores start their work early in the summer, even though the results don't usually appear until the end of summer). By contrast, late blight can attack at any time and can wipe out a tomato or potato patch in a couple of days. Late blight is what caused the great potato famine in Ireland in the 1840s. Late blight has not been a major issue with tomatoes in New England until a few years ago. It came to New England a couple of summers ago (they believe that it came from tomato plants that were trucked in to big box stores from down south) and wiped out many home gardens and commercial tomato fields alike. Most people will not get late blight. If you think you have it, contact http://usablight.org - a USDA funded program to track late blight and prevent its spread. One thing you can do to prevent late blight is to get rid of rotten potatoes (they may have late blight). Do not leave them out on top of the garden soil in the winter or in a compost pile that does not reach a high temperature throughout. They have to be completely destroyed, as do any tomato plants that do have late blight. The recommendation I have heard is to put them in a plastic bag, seal it tight and take it to the landfill. We grow seven different Cherry Tomatoes in five colors: black, gold, yellow, red and pink. Black Cherry (OG) is becoming very popular at farmer's markets. The flavor is considered excellent. Sun Gold cherries are delicious gold-orange fruit that are our most popular tomato. Also, we are offering a yellow cherry tomato called Esterina (OG). Esterina is the first hybrid yellow-gold cherry tomato. We have tried it in the home garden, and it is a great tomato. It makes loads of fruit and is just as tasty as Sun Gold. It was so productive that we had to reinforce our cages to keep them from falling over. The fruit is more yellowish than gold. High Mowing Seeds says it has good disease resistance. 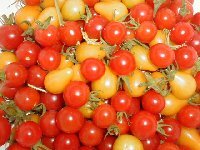 The red Peacevine (OG) makes delicious sweet red cherry tomatoes. It makes a large number of clusters of fruit, each with up to 8 fruit per truss. This seed is an open-pollinated version of an old favorite, Sweet 100 cherry tomatoes. The breeders who came up with Peacevine "de-hybridized" Sweet 100 cherry tomato (a process that takes 7 to 10 years by growing the hybrid over and over again for many years and saving the seeds each year and planting them the next year). The new open-pollinated variety is now called Peacevine. It is not exactly the same as Sweet 100, but very similar. (If you are interested in saving seeds in general and learning more about de-hybridizing hybrid seeds, there are two wonderful books we would recommend: Breed Your Own Vegetable Varieties (2000) by Harvard geneticist Carol Deppe and The Organic Seed Grower (2012) by John Navazio.) Also, we have Jasper (OG), the blight resistant red cherry (available only in 4" pots). We always grow Jasper in our front garden every year and they are a huge success. One plant made LOTS of small cherry tomatoes, sweet and delicious, and no sign of blight. At this point, they would have to be my favorite cherry tomato. The fruit are small, but the taste is great and they have very high yield! Another interesting variety is Tomatoberry Garden. This is a high-yielding small cherry tomato that is shaped like a strawberry, with soft skin and sweet, meaty flavor. Lastly, we have Cherry Falls. This makes loads of red cherries. The plant is excellent for containers. Many people will put one of these in a big bucket and grow them on their patio or deck. It only grows 6" tall but cascades down 36". Early Tomatoes. If you are looking for an early tomato, we have five choices. New Girl is a small-medium sized tomato, which replaced old-favorite Early Girl. It is indeterminate, so not only is it the first tomato to ripen, it will keep producing all summer. Another option is Juliet, which is a small saladette tomato. It comes in clusters of over 12 plum-shaped fruit per cluster. They are delicious and perfect for fresh eating right off the vine. They are also indeterminate. Juliet is one of the first tomatoes to make red fruit and it keeps producing cluster after cluster throughout the season. Juliet earns a gold medal in my book. It is reliable, productive and delicious. If you like saladette tomatoes like Juliet, and also like the sweetness of orange tomatoes, then give Jaune Flamme (OG), a French heirloom, a try. This is a high-yielding tomato loaded with fruit a little bigger than a walnut that are all very delicious. It is an excellent snack food. It is one of those tomatoes that every day you will stop to munch on while walking through and working in your garden. High Mowing Seeds says that Jaune Flamme is good for salads, sauces or drying. Another option is Honey Bunch Red Grape. These grape tomatoes are a lot like cherry tomatoes - they start early, the fruits are small and sweet (although grape-shaped, instead of round) and the plants make many clusters. Fruit should ripen by early July. Heirloom Tomatoes. What's an heirloom? Heirlooms are varieties that are at least 50 years old. People love heirloom tomatoes because of their special flavors and good looks. It is like having a different fruit to eat. However, heirlooms generally are less productive than more modern tomatoes. The compromise that most gardeners and farmers make is to grow a mix of both heirloom and modern tomatoes. That way you have a plentiful supply of tomatoes to eat and to cook with, and at the same time have something special to brighten up your table. Early Season Heirlooms. In the early-heirloom category, we have Moskvich (OG), a semi-determinate variety. Moskvich makes fruit the same size fruit as New Girl, but what makes it popular is its rich heirloom taste. The fruit have a soft skin, but they resist cracking. It is a good choice for an early tomato. It comes from Russia/Siberia and not surprisingly is tolerant to cool weather. Main Season Heirlooms. In addition to the two early heirloom varieties above, Moskvich and Mountain Princess, we have five main season heirloom tomatoes. Brandywine (OG) is the most famous heirloom tomato, for both its large size and good flavor. It makes huge tomatoes that weigh a pound each. As they are indeterminate and will keep producing, Johnny's recommends staking or caging these fruits - which also helps keeps the fruit off the ground. Brandywine has potato-leafed plants. Cherokee Purple (OG) produces large fruit (10-12 oz.) that are a multicolored dusky pink/purple/brown/red fruit. They ripen about a week earlier than Brandywine. They grow on short vines, so no pruning is recommended. Their flavor is highly recommended by every seed company. It is traced back over 100 years to Native Americans of the Cherokee nation. We are also offering German Johnson (OG), a favorite with many farmers who we grow seedlings for. It is from North Carolina and produces loads of medium-large pink fruit. It is also an indeterminate variety. A few customers have requested that we add Pruden's Purple (OG) to our list of heirlooms. We appreciate the suggestions! Pruden's Purple is comparable to Brandywine in size and flavor, but it has the added benefit of being ready to harvest one or two weeks earlier than Brandywine. Our last heirloom is Striped German (OG). This is an amazing tomato. Each fruit weighs ¾ to 1 pound. The fruit are marbled yellow to red. Matching its marbled looks, it has multiple tomato flavors all rolled into one. The fruit are a bit tender and you need to be careful when harvesting the fruit off the vine. If you pick them a little bit before they are completely ripe it will help keep them in good shape. A new variety this year is Valencia (OG), an orange beefsteak variety. It is a large fruit, supposed to ripen a little bit before Brandywine. Like most orange tomatoes, it will have that low-acid and extra sweetness to the flavor. It is an heirloom variety from Maine, named as it is reminiscent of Valencia oranges, and it is time-tested for our northern climate. Valencia was chosen for the Slow Food Ark of Taste! Our last heirloom is Weisnicht's Ukrainian (OG). It is a large pink tomato. It makes beautiful fruit and was a winner of the famous tomato tasting contest, the Massachusetts Tomato Contest in Boston. We are looking forward to trying this tomato this coming year. Main season tomatoes. We have eleven varieties of main season tomatoes. Big Beef was an AAS winner in 1994 and has been one of the most popular tomato varieties in the US for many years. It makes very large fruit (12 oz.) perfect for sandwiches. The fruit are firm and at the same time have great tomato flavor. They will last for a few days in the kitchen which also attributes to their popularity. For a large tomato, it ripens early in the season. It is an indeterminate variety, so they will keep growing and would benefit from staking. Bolseno is a new tomato offered last year by Johnny's seeds. It is Italian and bred for flavor. It produces large (7-12 oz.) red fruits. The seeds are very expensive, so we only offer it in 4" pots. We grew several plants and they are good tasting and productive. The fruit are a little bit flattened on the bottom as opposed to being totally global in shape. We plan to grow it again this year. It looks like a keeper! Celebrity was an AAS winner in 1984 and has been a favorite ever since. It makes medium-sized fruit and has been called a vigorous determinate. Celebrity is a tomato that is dependable, whether the year is one of rain, drought, sun or clouds. While other varieties may have their ups and downs, Celebrity makes a good crop of mid-size (7-8 oz.) beautiful fruit every year. Cosmonaut Volkov (OG) produces large (8-12 oz. ), great-tasting red tomatoes in August. It is an indeterminate variety. We had a Volkov in the garden this past year and the fruit were delicious - classic mouth-watering old-fashioned tomato. Whether or not Volkov is an heirloom is not clear. It was brought out of the Ukraine a few decades ago by the Seed Savers Exchange, and we assume that it has a long heritage behind it. Some seed catalogs call it an heirloom and others do not, so are not sure where to put it. We do know that it belongs in the garden! A new variety this year is Damsel (OG). Damsel is from a new organic breeder called EarthWorks Seeds. The fruits are large 10-12 oz. The taste is reported to be similar to Brandywine or Pruden's Purple, while the plant is resistant to disease, including resistance to Late Blight. We grew a few Damsel plants last year and the flavor was outstanding. One notable thing is that their skin is more of a pink color than red. Defiant PhR (OG) was bred at North Carolina State University in response to the concerns about blight affecting tomatoes. This variety has resistance to both early and late blight (which is astounding!). The fruit are very good flavored, mid-sized (6-8 oz., somewhere in between New Girl and Celebrity for size) and the plant is determinate. Late blight seems to be with us in the northeast. It was widespread in 2012 and then has hit various places in our region each of the past several years. It is something that we will have to deal with for the foreseeable future. We tried both Defiant and Iron Lady in the front garden in 2013. Defiant won the taste test hands down. 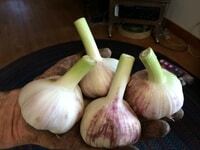 We have continued to grow it in the home garden and it produces a nice crop and tastes great. Even if it did not have blight resistance, I would grow it just for the flavor. This variety is a keeper. Jet Star is a dependable variety. For fresh market farmers, it was one of the top tomatoes to grow in the 1980s. It is an indeterminate variety that has very high yield of medium-sized (7-8 oz.) smooth fruit that taste great. For farmers, the percentage of marketable fruit is high. Jet Star is like Celebrity in that it does well every year, regardless of the weather. It is different from Celebrity in that it is slightly orange-red and the fruit are low-acid, while Celebrity is a pure red tomato. Neither of them is the newest tomato variety on the market, but they both produce a good quantity of good quality fruit year after year. A nice organic hybrid variety is Martha Washington (OG). Johnny's calls this an "heirloom quality fruit with a more reliable plant." I would agree. We tried it in the garden and the fruit are really delicious. The pink fruits are fairly large (8 to 16 oz.). The organic seeds are very expensive (about 25 cents a seed) so we are only offering Martha Washington in 4" pots. But well worth a try! Last year was the year for new tomatoes. Another new variety we tried was Pink Berkeley Tie Dye (OG). With a name like that, it gets your attention. The description in the FEDCO convinced us to give it a try. CR Lawn says it is "by far the best of all the new tomatoes I have tried." It is early and productive. The flavor is described as sweet, tangy, complex and spicy! Also, it has good disease resistance. The outside is dark pink with green stripes and the inside is pink with yellow streaks. It really did live up to the hype. Excellent tomato, the flavor was great. The fruit were large and plentiful. The only drawback was a little bit of cracking on the top on some fruit, but that seems like a small problem for a good tomato. Lastly, we offer Green Zebra (OG), which is an indeterminate variety that produces green tomatoes that have yellow stripes. The fruit are small-medium (4-5 oz.). The fruits start as pale green with dark green stripes. As the fruits ripen, the stripes turn yellow. Fruits are resistant to cracking and are succulent. Paste Tomatoes. While any tomato can be used to make tomato sauce, many people prefer a true paste tomato because they are meatier and have less juice. This makes the canning/cooking process a lot quicker and some people find the flavor to be even better when using a true sauce tomato. We offer five varieties, including three new varieites, all of which are plum shaped fruit - despite their differing sizes. Amish Paste (OG) is an heirloom paste tomato that comes from Wisconsin Amish farmers in the 19th century. The fruit are fairly large for a paste tomato (usually weigh about 8 oz. each). They come in clusters of two to four and the fruit ripe late in the season. This is an indeterminate variety, so it grows vigorously. Amish Paste was chosen for the Slow Foods Ark of Taste. After a few years of slow sales, we decided to replace Grandma Mary's with a new variety. We are offering Opalka (OG), a Polish heirloom variety. Opalka is an indeterminate variety that makes fruit that are great flavor (a plus for making sauce) and rather large (3" x5" in a bulls-horn shape). Also we have San Marzano (OG), which is a classic plum-sized (about 4-6 oz.) paste tomato that weighs. This plant is an indeterminate variety. People have asked for San Marzano by name and so we have included it in the plant list. It is excellent for canning. Last year we offered Mama Leone from Hudson Valley Seeds, but they did not have seed this year. So, we are offering some very new and different in its place - Sunrise Sauce (OG). This is a determinate variety with roma-shaped orange fruits. That means it will have some great flavor that will add to the appeal of you sauces. Lastly, we are offering Plum Regal (OG). Plum Regal is resistant to late-blight and has high yields of large 4 oz. red paste tomatoes. We also have Tomatillos, which are not a tomato, but is associated with tomatoes, so we put them here. Toma Verde (OG) makes green fruits that are great for making salsa. Another crop that is not really a tomato, but seems to appear in seed catalogs next to their tomato section is the Ground or Husk Cherry. We are offering Goldie (OG), which makes loads of fruit that are sweet and can be eaten fresh or in pies and deserts. Winter Squash Growing Tips. Winter Squash are similar to cucumbers in that they like warmth. Wait until the soil has warmed up (i.e. - early June) to put out your plants. Transplants are especially helpful at letting your plant get big (to the 5 leaf stage) so they can withstand an attack by insects. Many farmers that we know start half of their winter squash by transplant and the other half by direct seed. In a bad year, the bugs will completely destroy a new crop of just-germinated direct-seeded winter squash. By the time, that happens and you realize it, given the 3 months it takes to grown winter squash, it is often too late to start a second round of squash by direct seeding. If you really like winter squash, transplants are a worthwhile way to make sure that you get a good harvest. One question that comes up is how many can you expect to harvest per plant? I take the data we use in our variety descriptions right from the seed catalogs. These are just guides and in most cases the seed catalogs are right. But when it comes to winter squash, I find their estimates to be overly optimistic. In a good year, these numbers are true, but there are some years when winter squash don't do well due to prolonged and extended periods of summer rain. Sometimes the weather cooperates and winter squash does well. 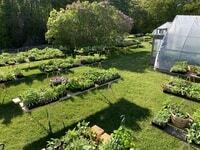 Other times, it varies from one variety to the next or from one gardener to the next gardener. So what is a gardener to do? The simplest suggestion to increase your yield is to give them a little extra attention. Winter Squash are an easy crop to ignore in the garden as they don't do anything for a few months, but they are worth the extra effort. Make sure they stay watered in a drought period and do all you can to promote bees visiting your garden (bees like native plants, also blue, white, yellow and purple colored flowers, most herbs, fruit trees, and wild meadows - avoid the use of strong pesticides that are toxic to bees). Storing and Cooking Winter Squash. Think ahead to fall when you can enjoy your own winter squash. If you can keep them somewhere cool and dry, most varieties will last several months. Buttercup, which may be the tastiest squash, usually lasts through Thanksgiving, while Acorn and Delicata will usually keep until mid-winter, Kabocha and Hubbard will keep until late winter, and Butternut will often last until the following spring. To extend their storage life, harvest and cure (i.e. - put them in a warm dry place for a few days) and then find them a place in your house or garage that stays around 55 degrees. If they are exposed to repeated temperatures below 50, they will only keep a couple of months. There are a multitude of ways to cook winter squash - bake it (face up or face down and add butter or maple syrup), cut into pieces, boil and make mashed squash (like mashed potatoes), or puree it into soups (curried butternut squash soup is excellent). Starting with acorn, we have Sweet REBA (OG) (Resistant Early Bush Acorn). This variety is resistant to powdery mildew. If powdery mildew should happen (e.g. during hot and humid weather), this variety will continue to put its energy into making fruit rather than dying off. This can be the difference between a plant that starts off great but dies before it makes fruit, and a plant that gives you a good harvest. Resistant does not mean 100% certainty, but it does make a big difference. Sweet REBA makes squash that weigh between one and two pounds each, and the plant is bush size, good at saving space in the garden. It makes 4-5 fruit per plant. We have two buttercup varieties. First is the standard Burgess (OG). The fruit have a button on the bottom. The fruit weigh 3-4 pounds each and you will get an average of 3-4 fruits per plant on vines that spread. We have added Bonbon. This is similar to the classic Burgess, but according to FEDCO's CR Lawn, it is just a little bit better in size, yield and taste. Not a lot, but when you add them all together it is worth giving it a try. We have two butternut varieties. If you want large butternut squashes, then grow Waltham (OG). This variety is an AAS winner that was bred at the Waltham Extension Station in suburban Boston in the 1960s and is the most commonly grown butternut squash in the US. It makes 5-pound plus fruits on long vines, and usually produces 4-5 fruits per plant. It you want something a little smaller, we are offering a new variety bred by Johnny's Seeds, Waldo PMR (OG). This makes 5 to 6 fruits per plant also, and they weigh 3 to 4 pounds each, and they have a small seed cavity. We were hesitant to give up on Metro PMR, but this looks to be about the same size and disease resistance, but it comes from an organic seed. We have to give it a try this year. Waldo has powdery mildew resistance (if you see PMR on any seed variety it means powdery mildew resistance). For Delicata, we have High Mowing's Delicata (OG). These are great tasting little squashes. They weigh 1 pound or a little more, and can yield 6 fruits per plant. You can tell they are ready to eat by their color. Let them become cream colored with dark green stripes. Also, we are offering Spaghetti (OG) squash. This is a favorite for many people. One tip from the FEDCO catalog is to make sure they are truly ripe before you cook them - let the skins get a deep gold, rather than a pale yellow. In the Sweet Dumpling category, we offer Sweet Dumpling. These are single serving, 4" one-pound squashes. These are ivory colored with dark green stripes and sweet orange insides. Blue Hubbard (OG) squash is an old New England favorite, especially for pies. Our friend Jeanne (who along with her husband Steve, have made and maintain this website) makes a delicious Blue Hubbard squash pie. Blue Hubbard squash pie is even better than pumpkin pie; it has a special spicy flavor, and is excellent topped off with some whipped cream! Each fruit weighs about 12-15 pounds. The shell is very hard, so be careful when cutting it open! We offered a new type of Hubbard squash last year, North Georgia Candy Roaster. This heirloom variety produces 2 to 3 large fruits per plant that each weighs 8-15 pounds. They are oblong shape. The outside is kind of pale orange and they will last up to 5 months in storage. They are renowned for their fantastic flavor roasted, stuffed or in pies. Lastly we are offering Winter Sweet (OG). This is a light gray Kabocha type squash (from the same squash family as Buttercup) has become popular with farmers and gardeners because of it is a reliable producer in the garden. The squash is fairly large (4-5 pounds) and makes 3-4 fruits per plant. The interior is orange which cooks up dry and sweet. Its flavor is at its best from 2 to 5 months after harvest. The Kabocha squashes are known for their long storage capability! You could say they taste as good as a Buttercup and last as long as a Butternut. That is a great combination. Balloon Flower. Florist Blue is a beautiful flower. Emma says the buds look more like Christmas lights than little balloons before they pop open. Either way, the deep blue is a beautiful color. They bloom for a couple of months in the summer. 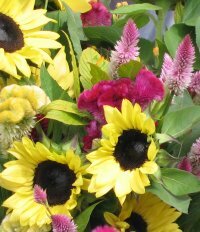 They have sturdy stems that make a nice cut flower. They may benefit from growing next to another flower that they can lean on for support. Blue Flax. Prairie Flax is an amazing little flower. It is the epitome of optimism; they make brand new blue flowers every day. Short plant (12" tall) makes a nice addition to a flower bed. It likes full sun and can handle drought. Butterfly Weed and Persian Catmint. Persian Catmint grows to about one foot tall and fills out. It is good filler for a rock garden. It is a member of the mint family, but ours seem to stay in place and are not invasive. The soft gray-green leaves are pretty and they are topped with small prolific blue-lavender flowers. Catmint blooms from mid-May to June or even longer. It is recommended to plant Persian Catmint along with Butterfly Weed. Butterfly Weed provides a splash of bright orange flowers on large 2'x2' plants. It has a tall upper story and needs something below it. Columbine. We are trying a new Columbine this year. It is called Pink Petticoat. It has a pink corolla (petals of the flower) with a layer of white petals just below the pink ones. They look like petticoats. Columbine is a beautiful flower that comes into bloom early in the season before most other flowers are in bloom. We don't sell very many plants and I am not sure why, but we keep growing them hoping for a revival! Coreopsis. Early Sunrise makes golden-yellow flowers that bloom from early summer until fall. This variety won the AAS award when it was introduced. It blooms earlier than most Coreopsis. The flowers attract beneficial insects like lady bugs and lacewings. It is a dense plant that fills the garden with color. Coreopsis is trouble-free and easy to grow. In a couple of years, you can divide the plants and spread them to other places in your garden. Although it is generally used as a garden flower, it is also good for cut flowers and bouquets. Delphinium. Delphinium is a beautiful flower that blooms early in the summer. The Summer Skies variety we have grown is no longer offered by FEDCO. So, we are trying Connecticut Yankee Mix. The colors range from blue, purple, lavender and white. This is a tried and true variety which won an AAS in 1965. It grows 3 feet tall, so it does not have the same need for tall staking as many other Delphinium varieties. Echinacea. We are bringing back Echinacea- Cheyenne Spirit, an AAS winner that flowers the first year. The colors range from vivid red, orange, purple, scarlet, cream, yellow, to white. As it is a mix, we cannot predict which color any one plant will be. Eryngium. This pretty flower is also known as Sea Holly. Blue Glitter has sturdy stems which make it a long-lasting cut flower. The flowers are kind of an electric blue. It can also be used as a dried flower for winter wreaths and bouquets. One article I read recommended "flash drying" them in the trunk of a car on a hot day for 24 hours. That preserves the color! Forget Me Not. This lovely flower is a little bit of everything. Some consider it a short-live perennial. Others call it a biennial. While to others it is a vigorous self-sower that lasts for many years. Whatever category it best belongs in, it is definitely a reliable plant that make beautiful sky-blue flowers early in the season when few other flowers are in bloom. If you don't dead head the blooms, they will begin the process of self-sowing for the next year. Our variety is called Blue. Heliopsis. Also known as False Sunflower. Heliopsis is a bright yellow daisy -like flower that blooms from mid-summer to fall. The variety is called Sunburst. It will be 18" tall the first year and eventually become 4' tall, taking up 3' of ground area. The foliage is variegated green, with the flowers sitting well on top. Shasta Daisy. Alaska is just a classic winner. Beautiful big white flowers stand up tall in the sun and say "summer is here." They are popular because white goes with everything, they are easy to grow, and long lasting. They will make blooms for as many as three months and make a nice cut flower, but most people just leave them in the garden as part of nature's bouquet. Sweet Pea. Most sweet peas are annual flowers that are well known. This sweet pea, Perennial Sweet Pea, is truly a perennial. It grows 6 feet tall. We have a 5' teepee-shaped crop support outside of one of our greenhouses, and each year this perennial sweet pea grows to fill it completely and then some. The flowers are the standard range of sweet peas: rose, white and pink. The blooms start in mid-summer and go through until fall. At the end of the year, remove the vines by trimming them close to the earth. Amazingly, they return year after year. Sweet William. This is one of the nicest cut flowers of all time. Sweet William is generally one of the first flowers to bloom in the summer and provides stunning bouquets while we are waiting for our summer flowers to come into bloom. No matter what season it bloomed, it would be beautiful, with its pink, red, white and lavender. This variety, Double Choice Mix, from FEDCO, is likely to produce some blooms the first year and then by the second year, when the plant is really well established, it will be much more vigorous and produce loads of flowers. It is technically a biennial, but it is also a vigorous self-sower. Many Sweet William patches will last for 5 or 10 years. Yarrow. Colorado Mix is perfect if you are looking for a perennial to fill up a bed or a mass border. It is independent-minded - it can spread fairly quickly, does not suffer from neglect or drought, and wildlife don't seem to bother with it. The flowers are prolific and are gentle colors (rose, yellow, apricot, red and white). Bacopa with its spreading plants and prolific little flowers is perfect for containers or hanging baskets. They can stand alone, and also work great when mixed with other flowers. The Blutopia Blue has lavender blue flowers that rise up about 5" and spread about 14". TheSnowtopia White is comparable to the Blue in that it spreads, but it is a little less tall. They make a nice combination together. Calibrachoa. This is the first series of Calibrachoa that is seed produced. We are offering Deep Pink. Calibrachoa is a very popular flower and is also known as Million Bells. The plants are 8-12" tall and spread 10-14." They will look good by themselves in containers or baskets, or used in combination with other flowers in large containers. Coleus. Chocolate Mint is a beautiful Coleus that can handle sun and shade (most coleus prefer shade). This variety has chocolate-colored leaves with nice mint-green margins around the edge of each leaf. Each plant is bushy and makes a nice mound about 10-12". We added Chocolate Covered Cherry Coleus last year. The leaves are rose color with mahogany shading into thin green edges. It would be beautiful by itself or would make a nice combination with Chocolate Mint. Last summer I saw a Chocolate Mint coleus in a large pot (whiskey barrel size) that was huge. They seemed to be a couple of feet tall and a couple of feet wide. I was amazed. Dianthus. Volcano Mix (OG) is an annual version of Sweet William. The main reason to grow this is that it will bloom in mid-summer, after your biennial Sweet William is finished blooming. If you really love Sweet William (who doesn't!) this is one way to keep it going. You will get the same long-lasting bouquets and beautiful range of colors. Heliotrope (Marine) is a garden favorite because the serrated dark green leaves look great, the big clusters of blue flowers are beautiful, and most of all because it has a lovely aroma. Put a few of them together in a garden close to your porch or in a nearby window box and enjoy their scent when you sit down at the end of the day. Whether you are reading an old-fashioned book, the news of the day on your laptop, or just contemplating life, a beautiful garden fragrance will make it all the nicer. Heliotrope blooms all summer long and can handle sun or part-shade. Larkspur. (Giant Imperial Blue Spire) is not only pretty but very functional. As a dried flower, it keeps summer going all year long. It is hard to imagine a winter without a few bouquets of dried Larkspur, Statice and Gomphrena hanging from the rafter in our kitchen. Larkspur will bloom in the garden for months and the flowers will continue until a hard frost. Morning Glory. We usually plant our purple, red and blue morning glories around our bird feeder for the summer. It is interesting to watch how the different colors take turns stealing the show and sometimes multiple colors are in bloom at the same time. Usually they only bloom in the morning and close up at lunchtime, but on a very cloudy/rainy day they happily stay in bloom all day. Kniola's Purple (OG) is the first morning glory to bloom in the season and continues to bloom for a long time, while the plant continues to grow in height to 8' tall. It has deep purple flowers. Clarke's Heavenly Blue is the classic morning glory that really takes over the show at the later stages of summer. The volume of flowers is impressive and the blue color is delightful. We are unable to find our regular red morning glory seeds this year, so we are trying out Sunrise Serenade, an heirloom variety that is cerise/ruby-rose flowers. The Giant White Moonflower is different from the other morning glory varieties. The seed is quite different and the early leaves look like something from the moon, although the large white flowers are truly like all morning glory flowers. Moonflower is quite popular in the southern US, and in the tropics, moonflower is grown as a perennial. For us in the north, it is recommended to enjoy them near the deck or porch and wait for the fragrant flowers to bloom in the evening. Nasturtium. We have two specialty nasturtiums. First is Nasturtium Blend (OG) from High Mowing Seeds. This is a LONG vined nasturtium. It will easily grow 5' long and can grow up to 10' long with adequate fertility. This makes an interesting hanging basket, or would work in a garden bed next to and hanging over a rock wall. Also, we have Night and Day, from Johnny's Seeds. This is a combination of flowers that are alternately mahogany and cream. A really beautiful flower combination! New Guinea Impatiens. There was a lot of concern among lovers of impatiens about the arrival of Impatiens Downy Mildew in 2012. It completely wiped out many crops. It turns out that 2013 and 2014 were not bad years for regular Impatiens (var. Walleriana). 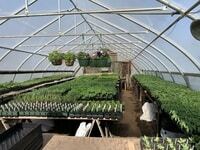 Greenhouse growers and homeowners are looking for alternatives. Some university sources are recommending coleus, begonias and New Guinea impatiens as shade substitutes, and morning glory, lobelia and salvia as part-shade substitutes. We are offering three varieties of New Guinea Impatiens: Divine Scarlet Red, Divine Lavender, and Divine White. The first generation of New Guinea Impatiens was large orange/scarlet flowers. In the past twenty years, there has been a lot of research into developing new varieties of New Guinea Impatiens, and many new colors are now available from seed. These new varieties come in a variety of new colors and the plants do well in the sun or the shade. One thing to consider is that these plants are 12" tall and will spread 12", so you won't need as many plants to fill a bed as you would with traditional impatiens. One plant from a 4" pot transplanted into a 10" pot on your porch will provide color all summer long. They are amazingly hardy plants and very beautiful. Petunia Fuseables. We are offering three fuseables this year. First, a description of what a fuseable is. A lot of seeds now are available in pellets. They essentially take the seed and air blast a little clay around it so that individual seeds are easier to see and handle. Some seeds like petunia are so small (there are some 25,000 seed per ounce - compare that with about 3,000 pepper seeds per ounce and about 100 green bean seeds per ounce), that they are a challenge to evenly plant in flats. A fuseable is when they take two or more seeds and pellet them together. Each pellet has one seed of each variety. Also, the fact that the plants grow up in the same pot helps make the two plants blend together nicely, so that the ultimate appearance in the hanging basket or container is balanced. There are several of these combinations that are really beautiful. Blueberry Lime Jam is a combination of two petunias - Sophistica Lime Green and Dreams Midnight (a purple color). It is stunning combination. A new variety this year is Pleasantly Blue, a combination of Dreams Midnight and Daddy Blue Petunias. Also, we have Healing Waters, which combines three seeds: two petunias (Easy Wave Violet and Shock Wave Denim) along with one Bacopa (large flowered Blue). It is really beautiful combination. If you look at the picture on the website, you will be amazed. All three of these will be beautiful additions to pots, baskets, barrels and garden beds. Petunia (Waves). The wave petunias are still among the most popular flowers. Why? For a few reasons: they fill up a large area of a garden bed or a hanging basket/container, the flowers are beautiful, they are reliable bloomers, and they do not require a lot of work (other than consistent watering). We have Rose (Shock Wave, which grows 7-10" tall), and Pink Wave and Purple Wave, both of which will grow about 6" tall. All of these colors will spread and spread, up to a three feet circle in total. Also, we have Tidal Silver Wave, which will grow over a foot tall. This is an ideal plant to use in combination with the other Waves in a container or basket. The Tidal Silver Wave will stand up in the middle of the container and give the basket loft. You can plant the other colors around the edge of the pot or basket. The color is really more silvery-white/pale lavender. The color goes well with other flowers. Rudbeckia. is a favorite flower for gardens. They are beautiful and easy to take care of. The plants are sturdy and do not need staking. They will usually bloom starting in mid-summer. Cherry Brandy plants are less than two feet tall and the flowers are a beautiful cherry-red. Johnny's Seeds calls them a tender perennial. Also, we offer Indian Summer, which makes large 4-7" gold flowers (gold petals with brown centers). They make great cut flowers. The plants are a little bit over two feet tall. These are also considered tender perennials. This year (2018) we have a new Rudbeckia called Cherokee Sunset Mix. These big 4-5" blooms will produce all summer long. The colors are yellow, orange or bronze. With a mix, it is uncertain which one will be in any 4" pot. If you like that range of colors, it is really worth a try. In general, whether Rudbeckia will survive over the winter will depend on the weather. We had a number of them in trays two years ago, outside and right next to a greenhouse. All of the snow for the winter slid off the greenhouse on top of the trays. We had forgotten about them. In the spring we found them underneath 5 feet of snow. They all survived. Maybe the snow acted like a blanket! Runner Beans. (Scarlet) These seeds are the total opposite of fuseables. Each seed is big enough to use as a piece to move around the Monopoly board. The runner bean is aptly named for the 6 to 12 foot running vines that each plant produces. In addition, the plant has several good uses. First, beautiful red flowers attract hummingbirds. Second, you can plant a row of runner beans in the ground alongside your porch, and with the help of netting, create a wall of living shade to keep out the afternoon sun. Third, FEDCO seed catalog says that people in Central America, where this plant originated from, eat the starchy roots. Fourth, the bean pods can be eaten before they get too big and apparently are the main reason that runner beans are grown in the United Kingdom. Salvia. Our selection of Salvia is Gentian Sage. It has bright blue flower spikes that are 12" long. It takes three months to grow from seed to transplant. It is a well-known perennial in the South. We also offer the standard Marble Arch Mix II Salvia as an annual flower in six-packs. Both of these varieties are good for cut-flowers. Zinnia. Zowie! 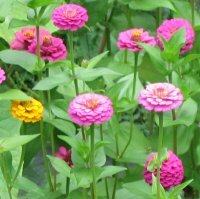 Yellow Flame is a special zinnia. Each flower is bi-color that changes color as it blooms, from magenta-pink to orange-red with yellow. The flowers are 4" big and the plants are two to three feet tall. It was a recent AAS winner. It is unique and worth adding to the flower garden. Unfortunately, the seeds are very expensive and so we can only offer it in 4" pots. If you have any comments or suggestions about varieties, please drop us a note. We appreciate your observations about how vegetaables and flowers grow in your garden and suggestions of the varieties that you like. So many of our varieties we grow because of your suggestions.